Abstract. Visual signals such as plumage characteristics in birds often play a key role in the establishment of dominance in contests by acting as a badge of status that can be used to assess individual fighting ability. We studied the role of plumage colouration in males of the red bishop (Euplectes orix), a sexually dimorphic and polygynous weaverbird species occurring in sub-Saharan Africa and breeding in dense colonies around water. Males are highly territorial and often engage in competition over limited resources such as breeding sites and potential mates. By experimentally staging male-male contests over a limited food source, we wanted to determine whether the orange-red breeding plumage in this species serves as a dominance signal between individuals, with males with redder plumage being dominant over those with duller plumage. In the first set of experiments, we staged contests between unfamiliar and unmanipulated males. The setup of the second set of experiments was identical to the first, with the exception that those males with the lowest chroma and hue values had their plumage experimentally reddened within the range of the natural variation. In addition to plumage colouration, we incorporated testosterone levels, body condition and age into the analysis of factors contributing to contest outcome. Our results show a consistent and strong age effect in both sets of experiments, which seems to be independent of plumage colouration, testosterone and body condition. 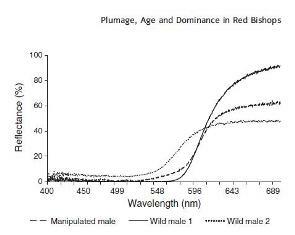 This suggests that in the red bishop, the outcome of male-male competitions over limited resources is determined by age-related acquired experience rather than by status signalling through plumage colouration. Reflectance spectra of two Southern Red Bishop males found in the wild (solid line shows upper extreme of plumage colouration in the field; dotted line shows an example of the lower end of plumage variation) in comparison to a manipulated male (dashed line) in the aviary. The manipulation was applied with a red Copic marker selected to correspond to the colour variation found in the field.